Aiding substances: glucose, microcrystalline cellulose, calcium stearate, talcum, povidone, E 104. Pharmacological operation: Vitamin C is characterized with multilateral actions: Facilitates assimilation of carbohydrate and proteins, iron absorption form food, formation of steroid hormones; takes part in blood coagulation and metabolism processes; among them vitamin B12 synthesis; increases organism’s contradiction ability toward the infectious diseases; decreases pass of vessels walls. By taking part in those processes C vitamin influences on inflammatory and allergic reactions and facilitates restoring and protecting processes current in the organism. Decreases cholesterol in blood and forwards normalize of arterial pressure. Indication: Hypovitaminosis and beriberi, lowering immune resistance, prophylactics of upper inhalant infections; bleeding from gums; appetite lowering; increases physical and mental work; tiredness, asthenia state, iron-deficient anaemia, leaning toward bleeding, with increased pass of capillaries walls, post diseases transferring recovering period. Contra-indication: Allergic reactions toward the components of the preparation. Using rule and dosage: The preparation is taken perorally after eating. Children up to 6 age - from 100mg to 300 mg (from 1 to 3 pills twenty-four hours a day). Overdose: Ovedosage of vitamin C may cause anemia, headache, polyuria, cramps, diarrhea, vomit, nausea. Formation of pebble in the kidneys, Because of significant increase of urine acidity, there is a risk of pebble formation in the kidneys and urinary tracts (urate, oxalate, cysteic). Treatment is symptomatic. As great amount vitamin C is secreted with urine it doesn’t cause toxicosis. In the literature is described the event of 15gr C vitamin taking for 4 months daily without reaction reveal. 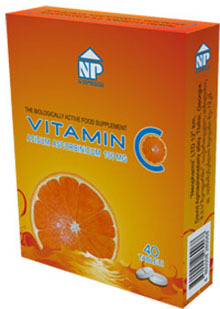 Pregnancy and lactation: Taking of vitamin C is recommended at time of pregnancy and lactation. Side effects: There won’t be side reactions if the preparation is taken with indicated dosages. If vitamin C will be taken overdose for a long time (more than 1 gram in a day) there may be developed headache, nausea, vomit, diarrhea, skin redness, excess urine secretion. Overdosage may cause formation of pebbles in the kidneys. Package: 20 pills in pvc/alu blister. 2 blisters are put in carton box. Storage conditions: Is kept not more than 25°C temperature, keep away from children.